Now entering it’s 11th season, Supernatural, by this time, is critic proof. Saying that, I really still enjoyed Season 10 of the show, and it’s presentation on Blu-ray Combo Pack is top notch. Supernatural still probably has another 2-3 years before it has stayed out it’s welcome. By now, everyone pretty much knows the story of the Winchesters. Sam (Jared Padalecki) and Dean Winchester (Jensen Ackles), are two brothers that were taught from a young age to become hunters and protectors of humanity against things that go bump in the night. Through the years, they have had many adventures and have saved the world multiple times. This year, after successfully defeating the angel incursion in Season 9, the Winchesters are forced to face the repercussion from their decisions. Season 10 starts out with Dean waking up as a demon and continuing his bromance with Crowley (Mark Sheppard), The King of Hell, while Sam and Castiel (Misha Collins) are trying to find Dean and bring him back from the dark side. This story continues throughout the season as they try to rid Dean of The Mark on Cain. During the course of Season 10, we are treated to the return of the ever lovable Charlie Bradbury (Felcia Day), as she returns from her trip to Oz, as well as a new character, Rowena(Ruth Connell). She is Crowley's long lost mother. Her addition to the show, and the appearance of Charlie, help shake up the show a bit and provide new directions for the season to go. During this season, the 200th episode of the show aired, and to highlight this special number, the cast and production crew created a musical based episode entitled "Fan Fiction". While basically being a love letter to fans, it tells the story of the "Road So Far" that the boys have traveled, using a female high school chorus. Even though this episode was hailed by my colleagues as one of the highlights of the season, I just didn't enjoy it. For myself, it was on par with the Buffy The Vampire episode "Once More With Feeling". Both seemed out of place and had all the elements that would make me not watch this type of show. However, there is still a nice cameo by Chuck Shurley (Rob Benedict) in this episode, which almost makes it enjoyable to watch. As with most Warner Bros. television releases these days, Supernatural Season 10 is presented in 1080p AVC with a DTS HD-Master 5.1 audio. The picture quality is top notch and has never looked better. There are no visible artifacts, the colors are sharp and crisp, and there is no digital noise. The audio soundtrack compliments the picture very well. The audio mix is perfectly balanced and at no time does the dialog or special effects drown each other out. Now entering it's 11th season, Supernatural, by this time, is critic proof. Saying that, I really still enjoyed Season 10 of the show, and it's presentation on Blu-ray Combo Pack is top notch. Supernatural still probably has another 2-3 years before it has stayed out it's welcome. 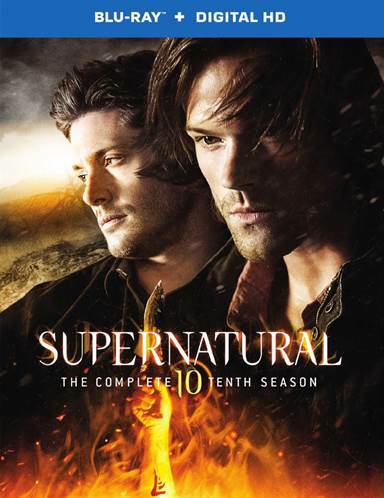 Download Supernatural Season Ten from the iTunes Store in Digial HD. For more information about Supernatural visit the FlickDirect Movie Database.